Maria Hjorth won her first LPGA tournament in eight years, but during that span she won twice on the LET – both of them at the Ladies English Open, which she won back-to-back in 2004 and 2005. Hjorth hasn’t been one of my favorites – no dislike of her either, just another player on Tour to me. We got to see her emotional side during Rosie Jones’ interview and that nearly always wins me over to a player. Even though I was rooting for Stacy Prammanasudh, I ended up being very happy for Maria. What a crushing Sunday for Virada Nirapathpongporn – she started the day at -9 with a Top 10 (or better) in sight and proceeded to bogey her first seven holes and shoot 82. The T30 finish helps her money list standing a bit, but she was on target to challenge the Top 90. “Whatever does not kill me, makes me stronger” – I hope NP3 has that thought in mind this morning. Sherri Turner earned $13,125 for her T22 and is now a lock to make the Top 90. Minea Blomqvist picked up $8713 for her T30 to greatly improve her chances. Dina Ammaccapane moved up $2330 which puts her right on the estimated cut line. I’ll update the status of everyone on the bubble in the next day or so. When is the LPGA going to officially announce that Angela Park is the 2007 Rookie of the Year? By my reckoning she clinched it when the Arkansas event got washed out. Angela shot 63 Sunday to finish tied for third – her sixth Top 10 of the year and her fourth Top 5. Teresa Lu receives this week’s Big Surprise Award. She finished tied for ninth for her second Top 10 of the year. Shout-outs go to Eva Dahllof (T11) and Lisa Fernandes (T13). Ai Miyazato certainly had a miserable week but the Big Disappointment goes to Laura Diaz, who missed the cut after I had her pegged for a Top 5 finish. Dishonorable mention to Brittany Lincicome for also missing the cut. One More Thing: The average score at Navistar was 73.375, virtually the same as the 2007 season average. Through this time last year the average was 72.964, so 2007 is now 0.408 strokes per round higher than 2006. It's the schedule change, I'm tellin' ya! Interesting jockeying this week for the final positions at the limited-field Samsung World Championship -- made more interesting by the tournament's decision (reported by Mulligan Stu but not yet showing up on the Samsung web site) that Samsung has claimed a special "Hall-of-Fame" exemption for Annika Sorenstam in the last few days, but was still limiting the field to 20 players. Anyway, the new exemption had the effect of bouncing one of the players who would otherwise have qualified via the money list (finalized following the Navistar). With 3 exemptions awarded to players outside the Top 20 on money list (Wie, Sorenstam and Hauert as the LET rep), the money-list qualifiers are now seemingly those up through number 17 on the money list. 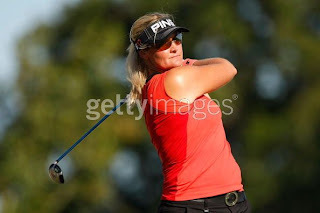 Going into the Navistar, Sarah Lee was 17th at ~$652K, Natalie Gulbis 18th at ~$650K and Angela Stanford 19th at ~$640K). Gulbis skipped the Navistar, and Lee and Stanford were tied at -1 through the second round. Then, Stanford went 65-72 on the weekend to Lee's 69-78, pushing Stanford into 17th on the money list and (while I haven't seen any announcement yet) into the last spot in the Samsung. Edit -- Hjorth obviously leapfrogged Lee, Gulbis and Stanford with the win in Alabama. So, those three would have been 16th, 17th, 18th going in. Sarah Lee is the unfortunate player to get knocked out by the Haughty Swede's invitation. The updated money list shows her 18th. Gulbis would have been knocked out anyway by Hjorth and Stanford jumping into 15th and 17th place. Wouldn't surprise me a bit if the LPGA had something to do with the last-minute exemption. Given that you are numbers guy, any possibility that Lorena has already locked POY award? Is there any chance of somebody catching her? I'm kind of surprised that you always refer to Annika as the "Haughty Swede", although not my favorite player, she seems to be nice and relatively humble given her success.. I'll investigate the Lorena POY question and post the results soon. For several years I felt the same as you about Annika - on camera, she's as modest and unassuming a person as you'd ever meet. But several times in recent years, she done things to suggest that she believes she isn't required to follow the rules of the LPGA and golf in general. She did it just recently when she backed out of the Canadian Open because of her back but went ahead and played all four rounds in her event in Sweden. I'll admit that "haughty" may be a harsh term, but there are worse ones I could have picked!